GX Series amplifiers are ideal for professional entertainers who require maximum performance and portability on a limited budget. 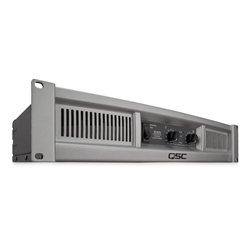 The hallmarks of the QSC brand - professional audio quality, meticulous engineering, precision manufacturing and long-term reliability - are all intrinsic to GX. Add contemporary styling, multiple input/output options, light weight, and advanced protection circuitry, and the GX Series power amps clearly represents real value - something everyone can use.